Just Like Starting Ogre: Shrek Forever After throws out the films’ history—and it’s an improvement. Many of us have suspected it all along, but with Shrek Forever After, it becomes official: The Shrek film series is actually a sitcom. Since time immemorial—OK, since the late ’70s—there has been one reliable signifier of TV situation comedies that had run out of ideas, or never had any to begin with. That would be the “fantasy episode,” the one that speculates “What if these characters had never been born, or never gotten married, or never had that wacky misunderstanding in Season 2?” Actors love the concept, because it gives them a chance to do something different with characters who are familiar—and viewers often hate them for exactly the same reason. The Shrek films are an interesting case in that regard, because I’ve never gotten the impression that people are particularly fond of these characters. Sure, Antonio Banderas’ goofy-suave Puss in Boots has some fans, but are there really folks who adore Shrek, Fiona and Donkey? Or have the previous three Shrek films just generally been filled with enough satisfying gags that the protagonists and plots are rendered somewhat … irrelevant? That may be the lesson to take away from the revitalized Shrek Forever After, which tosses our ogre friend and his Far Far Away pals into another homage to It’s a Wonderful Life. Fuming once more about being domesticated and forced to deal with husband/dad responsibilities, Shrek (Mike Myers) wonders what it would be like to be his old, fearsome self again. And he finds an obliging assistant in that speculation—the devious elf Rumpelstiltskin (Walt Dohrn), who once lost his chance to steal the kingdom of Far Far Away, thanks to Shrek’s rescue of Fiona (Cameron Diaz). Rumpelstiltskin offers Shrek one day from his carefree past, but, of course, there’s a catch: Once that day is over, it will be as though Shrek had never been born. And the world in which Shrek never before encountered all the other regular characters has its intrigues. Rumpelstiltskin is now the despotic king; Fiona, never freed from her curse by “true love’s kiss,” has become the freedom-fighter leader of the kingdom’s ogres; Donkey (Eddie Murphy) … well, he’s still annoying; and Puss, in the most amusingly handled development, has become Fiona’s obese house-tabby. Naturally, Shrek will come to realize that he has been liberated not just from the entanglements generated in the first three movies, but also from their pleasures. Shrek Forever After, on the other hand, definitely benefits from that liberation, particularly after 2007’s lumbering third installment. This is a friskier, less bombastic Shrek, one that has fun with concepts like Shrek having become such a predictable celebrity that annoying kids ask him to “do the roar.” Fiona’s hardened personality—one formed by not having been rescued, and being required to rescue herself—works as well, providing nice tension to Shrek’s attempts to re-woo her for a saving kiss. And there’s a lot of good stuff involving Rumpelstiltskin, a fuming would-be Napoleon voiced by animator Dohrn with an enthusiasm that reminds you how many great supporting characters in contemporary animation have been brought to life by nonactors. 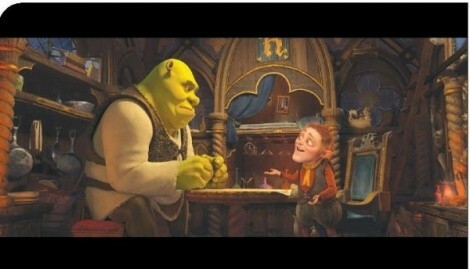 But mostly, Shrek Forever After eases back on the smug referential humor that has always driven the series. From Day 1, it was built on swipes at Disney’s fanciful fairy tales, and that inferiority complex always felt more sad than clever. Though there are still a few of the expected anachronisms—an ogre (The Office’s Craig Robinson) with a fondness for chimichangas, or a trailer park for witches—the humor here generally isn’t about heavy-elbowed pop-culture nudging. I can’t even recall a single fart gag. The downside to that approach is that screenwriters Josh Klausner and Darren Lemke don’t always seem to know what they should be doing to provide chuckles. There are more smiles here than big belly laughs, leading to something that often works better as an adventure—thanks to solid action work from director Mike Mitchell (Sky High), doing his first animation work—than as a comedy. Will those who embraced the more raucous Shrek of films past be disappointed? Possibly. For those who won’t find a change of personality any great loss, however, it comes as a pleasant surprise. This is one sitcom that actually needed to jump the shark, since it seems it has found firmer ground on the other side.